You don’t have to spend long on my Pinterest page to know that I’m obsessed with gray hair. So it should be no surprise that I’ve spent the last year of my life trying to get my naturally warm-toned hair the coolest shade of blonde there is–basically one step away from gray. When I first began this journey, the only person I had seen with this color hair was Julianne Hough, so naturally, I flew to LA to have her colorist, Riawna Capri of Nine Zero One salon, give me the color. In the past year, the blonde-without-a-touch-of-warm-hues color has gotten increasingly popular, and I have seen it pop up on a few other people. But what happens when you have this color blonde is you have to work hard not to get any yellow in it, which brings me to the topic at hand: purple shampoo! As I’ve talked to people about using purple shampoo, I’ve been surprised how many of them had never even heard of it, which is why I decided this post was so important! Purple is the exact opposite of yellow on the color wheel, so, if you are trying to combat brassy, yellow colors (which pretty much all blondes are), you want to tone it with something purple. 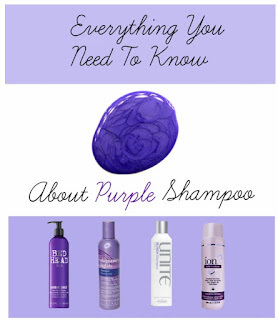 And even if you have never heard of purple shampoo, it’s actually not that hard to find–but you want to make sure you use the right stuff! *It should be a dark, dense color. 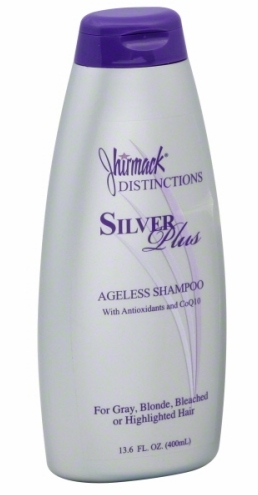 *The longer the shampoo sits on your hair, the more pigment is deposited on your hair. 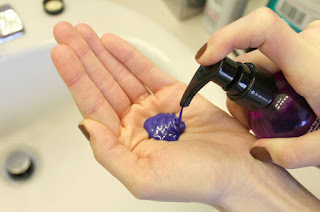 *If you want an even heavier dose of the toning power of purple, put the shampoo on dry hair, massage it in, let it sit for 10 minutes, rinse it and wash again on wet hair. *If your hair goes too icy/purple for you, just get back in and wash again with a regular shampoo. This is the greatest shampoo ever. I’m seriously obsessed! It does a wonderful job toning and leaves my hair soft and smooth. This is my go-to when I haven’t planned ahead to order my Blonda online. It’s available at Ulta, works great, and really helps combat the color-treated hair dryness. This is like the original purple shampoo. It’s been around forever, and gets the job done! I’ve also heard amazing things about this one–namely that it has a really intense color, so it works well/quickly, but I’ve never tried it. But I will be soon! So, have you tried purple shampoo? Which one is your favorite? I had a big night coming up and didn't want to lose latest wash-in color, so I waited to use it. It definitely takes out the color. I have been using it for about 3 weeks, and use it every other day because it tends to make my hair flat, but I do see a difference in the growth. Happy excellent product!